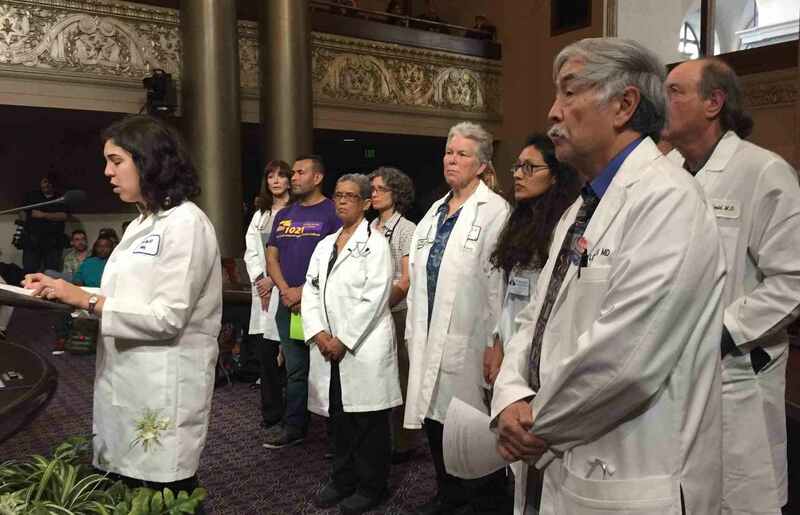 Sporting white jackets and stethoscopes, a delegation of 13 health care providers spoke out against coal at the Oakland City Council Open Forum on March 15. The delegation included doctors, nurses, nurse practitioners, and other health professionals. They submitted letters signed by over 200 local health care providers and public health professionals as well as several major health associations, including the Alameda-Contra Costa Medical Association, SF Bay Chapter of Physicians for Social Responsibility, Network of Ethnic Physicians Organizations, and Golden State Medical Association. Together the associations represent over 25,000 members locally and throughout California. Their message was uniform: export of coal through Oakland presents significant public health and safety concerns and should be prohibited. “The plan to ship coal by train from Utah to sites overseas is wrong on so many levels. The combustion of coal worsens climate change, the greatest public health threat that humankind has ever faced. “On a local level the peoples’ health will also be harmed. “Coal dust is a devil’s brew of toxins and these toxins WILL be released during the transport, unloading and reloading of coal. It is inevitable that west Oakland will be the hardest hit. Dr. Kirsch called on the council to stand with the health care delegation on behalf of life and against the shipment of coal through Oakland.